Riyadh, 26 September 2018: In honor of Saudi National Day, Al Faisaliah Hotel Riyadh hosted a 3-day celebration at the hotel, offering guests a range of festive experiences and extraordinary culinary treats in line with the historic day. The event was well-received, with a remarkable number of guests attending from all across the Kingdom. A key part of Saudi history, the day celebrates the establishment of the Kingdom of Saudi Arabia by King Abdulaziz in 1932 and symbolizes the ideals and hopes of the Kingdom. It provides a sentiment of pride for the country and symbolizes a sense of appreciation by the citizens, being proud of everything that the country has achieved. The national day celebration also comes in line with highlighting the strong hospitality market in the kingdom, which has seen tremendous development and growth in recent years and according to a new report, is expected to witness a 13.5% compound annual growth rate (CAGR), until 2022 which is the highest in the gulf region1. Located in the heart of Riyadh, Al-Faisaliah Hotel had the opportunity to showcase its deep appreciation and patriotism for the kingdom and its citizens, while reflecting the spirit of the day for three days from September 21 to 23, 2018. Guests were able to enjoy traditional folk culture and authentic Saudi cuisine, allowing them to truly feel part of the warm and rich Saudi culture. 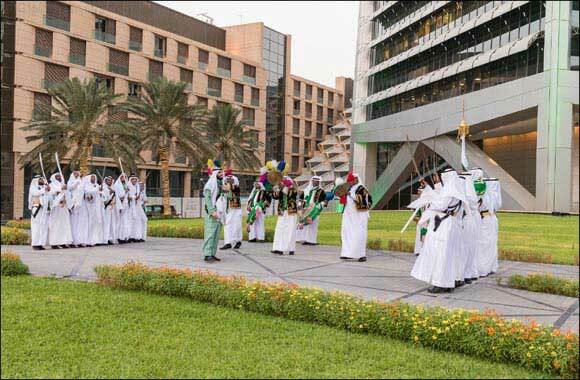 The highpoint of the celebration was witnessed on National Day, September 23rd, where the hotel invited key guests to witness the entire Al Faisaliah Tower turning green, a Saudi traditional sword dance “Ardah”, live entertainment from Saudi music artists, and a green and white cake cutting ceremony on the day, which proudly displayed the kingdom’s flag colours. Special food & beverage menus offering a wide selection of new dishes and refreshments, and added in-room amenities, were also available only during these celebrations.